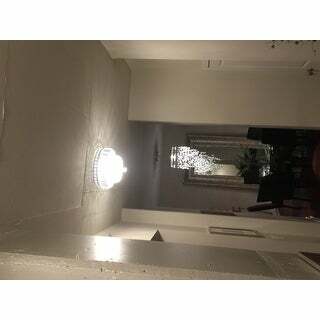 I love this item; the lighting radiates on the ceiling is so beautiful. it was easy to assemble and I will definitely recommend this item to family and friends. 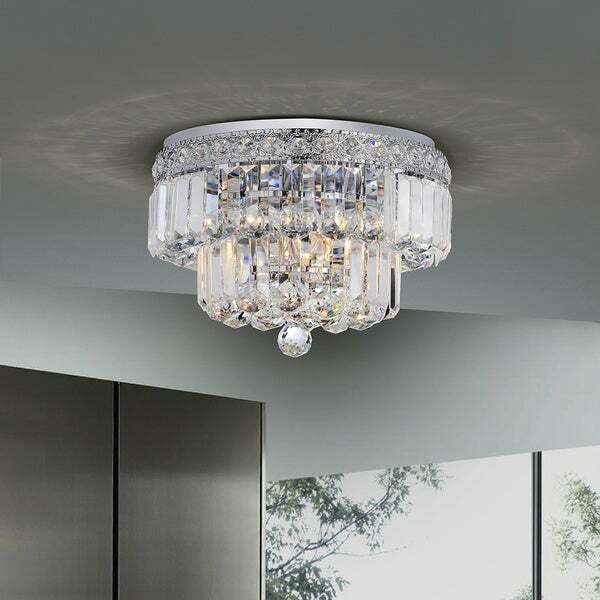 This crystal chandelier is a 2-tier flush mount fixture crafted from high-quality iron. This beautiful candelabra fixture offers the very best of elegance and durability. 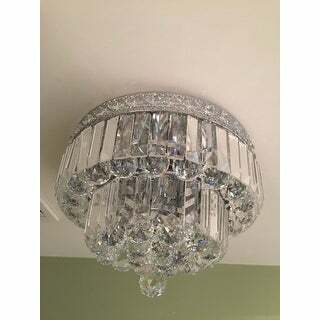 We have this is our master over our bed.. it is such a beautiful and elegant light fixture. I saw an extremely close version of this chandelier in a specialty shop. The retail price quoted was $1416.00, which is out of my budget. Then I saw this chandelier and thought, "it looks real similar to the high end piece, but do I want to risk that the knockoff is of aweful quality." Well, I went for the risky choice and placed my order. The item arrived in a not so great looking box, and sceptisism was rising that I would be pleased with the product. Out of the box, I saw that the metal was relatively thin, with very sharpe edges, so please be careful about that. Also, the wires weren't color coded, but my husband figured it out. After mounting the chandelier frame, the crystal pieces had to hand mounted. The crystals were all individually wrapped and well packed with no damage at all to the crystals, so I didn't mind having to handle each one, but gave me an appreciation of the quality of the product. These are real crystal and very heavy, a touch of glamour at a price I can afford. It's a go-go-go on this product. The results are beautiful! Another childhood dream come true! Obsessed with this. I have this in my baby’s nursery (about a 11x12 room) and looks stunning. Super expensive looking and perfect for a girl or a lady alike. The sparkle it gives off on the ceiling/walls is beautiful. I would advise putting it on a dimmer, as it gives off A LOT of light. It was much too bright for the room, so installed a dimmer and I just love it. Cons: RIDICULOUSLY difficult to install. Maybe it’s just us, but we had 2 men working on this for a long time. Didn’t come with the right install parts so had to improvise. Worth it, because of how awesome this light is, but be prepared. Side note: my mom bought this for her bathroom (unbeknownst to me) and also looks awesome - so really versatile light. Looks beautiful. Takes a while to string all of the crystals by hand but it is well worth it. I love this chandelier... It's a little bit bigger than I thought. We added it to our walk in closet and it is beautiful. This light is as beautiful in person as it is in the picture. The crystals are beautiful and seem to be well cut and reflect light wonderfully. I was worried it wasn't going to be bright enough, but it lights up my 20'x15' room fairly well and I love all the little rainbow prisms of light it reflects on my walls. It took two people two hours to hang this, only to find out it was defective. The top metal tier had 26 holes drilled to accommodate 20 crystal balls. Therefore, I had to place the balls in every other hole. 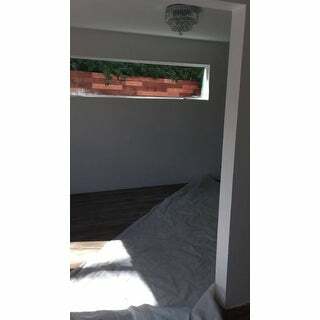 Otherwise, there would be lacking crystals, which would fill the space unevenly. Also, the center crystal was missing. Ironically, the light still looks amazing, and people who see it say they'd never know there was an issue. *** from Overstock was extremely helpful in trying to assist me with this problem. No way was I going to take it back down, so she is sending me the missing parts as well as a replacement metal tier. I can't understand how the metal could have been drilled wrong. I'd buy additional fixtures like this if I knew they weren't defective. That said, no matter what, the end result was a beautiful light in my downstairs office. In fact, because of prompt customer service and the overall appearance of the light, I am going to change my four stars to five! This chandelier was really hard to install. Like other reviewers, I suggest you install the fixture first, then attach the glass pieces. I'd recommend starting with the circle glass pieces then adding the rectangle parts. Trust me, it will be easier that way. There is defect with one of the screws that came with mine, so it's not super snug against the ceiling (which concerns me, but my husband thinks it's fine). Overall, it's really pretty but a pain to install. I LOVE this chandelier. It is so beautiful and it looks so expensive. And despite the over 100 pieces of crystals that needed to be attached, I was able to do it in about an hour's time. I have this in my bedroom with a dimmer and it makes a beautiful shadow on my ceiling with a rainbow of colors. I put this chandelier in my master bath. It was easy to install and looks gorgeous. It really brightened up the bathroom. I love it. Beautiful flush mount chandelier! It is simply stunning in our master bathroom. Overstock also had a ceiling fan with a similar chandelier. I was able to purchase the ceiling fan to go into the master bedroom and the flush mount to go in the master bathroom. Perfect match! Yes, fabulously elegant. Great size for my formal dining room. We have yet to have our contractor install this beautiful light as we are still painting the dining room. 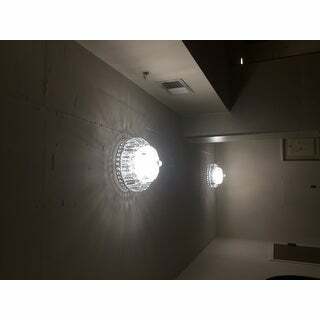 We have now purchased 5 lights from overstock for our hone, we love overstock! Just a beautiful, modern and sophisticated chandelier. Placed in my walk in closet. Hubby doesn’t like chandeliers, but this one he really liked. Contractors installed chandelier while I was out and returned home to see it up. Super fast shipping. I love these lights! Have the electrician hang the fixture and then friend to help hang the crystals. It’s actually a fun project to see it all come together. Soft light is way more flattering than natural light bulbs. 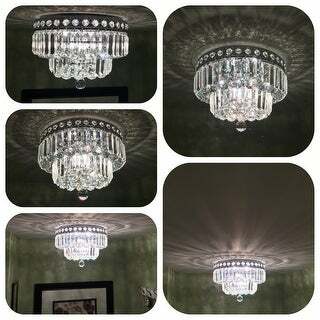 Beautiful chandelier that shines so bright in my foyer. It's the first thing most guests comment on. Goes great with my decor and provides the light needed in the area. Would purchase again. "How do I clean/dust this chandelier?" 1. Wipe the crystals one by one. 2. A wet cotton cloth can be used to wipe the chandelier. 3. Cleaning the glass pieces with flannelette is not recommended. 4. To prevent the metal from being rusted, please do not use the salt water when cleaning the crystals. 5. Hold the crystals and be careful when cleaning them to prevent them from falling. "Does this chandelier come in gold?" This chandelier does not come in gold. It comes in chrome. We do not have a chandelier in gold with the same style. "Does this chandelier come in 18 inch?" This chandelier comes in 14 inches instead of 18 inches. "Are you able to put this light on a dimmer switch?" "Do you sell incandescent e12 60 watt candelabra light bulbs for this?" "How easy is it to change the bulbs? Does one have to remove the crystals to access the bulbs?" There is no need to remove the crystals to access the bulbs,you can change the bulbs through the spaces among the crystals. "Do you have to hand the middle globe?" They were a pain to put together!!! An you have to have small hands to put the lights in. It took me an my husband an daughter with small hands over 3 hours to put together. Each crystal had to be put on it!! It's glass an sparkles wonderful!! I really do love them an well worth all the work. Over priced for all the extra work! !